There were (and continue to be) so many programs and bailouts proposed and engaged in to try to "help" the housing market in 2008-2009, that I have lost count. However, with Freddie and Fannie now owning an impressive amount of the housing stock in this country, central command has even more power to 'affect change'. It appears the powers that be are mulling becoming the world's largest landlord! Frankly I find this cool - I mean when a renter doesn't pay their rent, wouldn't it be super awesome to get a call from Obama demanding payment? The Obama administration is examining ways to pull foreclosed properties off the market and rent them to help stabilize the housing market, according to people familiar with the matter. While the plans may not advance beyond the concept phase, they are under serious consideration by senior administration officials because rents are rising even as home prices in many hard-hit markets continue to fall due to high foreclosure levels. "Adding more stock simply increases that overhang. If that can be avoided, it should be," says Jared Bernstein, an economist who left the White House in April and is now a senior fellow at the Center on Budget and Policy Priorities, a liberal think tank in Washington. 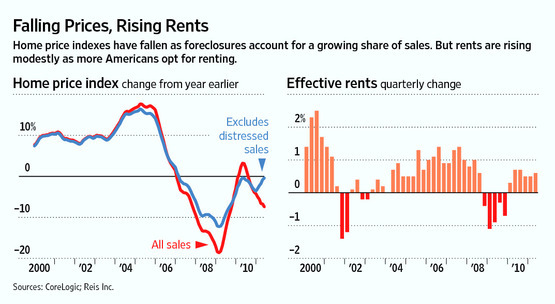 Because rents are firming up, "this idea could have some legs," he said. But scattered-site rental programs could require the government to become a national landlord, an area where the mortgage firms have little experience. They also pose accounting challenges that could produce big upfront losses. One proposal winning support among some federal officials would sell thousands of foreclosed federal properties to private investors who agree to rent them. Investors would rehab homes, run the leasing process, and contract with national property management firms to handle day-to-day tenant demands. HUD owned about 69,000 homes at the end of April and sold 11,000 homes in that month. Fannie and Freddie held another 218,000 at the end of March. But the Obama administration can't enlist Fannie and Freddie's participation in a wider rental program without the approval of the firms' regulator, the Federal Housing Finance Agency. An FHFA spokeswoman says the agency is "open to considering initiatives that are consistent with the goals of the conservatorship."